I first heard of YikYak earlier in the year when a doctoral researcher I was doing a project on social media use mentioned it as the “thing the kool kidz are using now”. At the end of the summer Dr Nick Pearce at Durham blogged about “YikYak Lecturer” or YYL at Durham who had been using it to provide assistance to students during the exam resit season. So, I installed the app on my phone being fairly clueless about it, I didn’t even realise it was anonymous. And my first thought when I saw that it was, was “oh God this is going to be an utter car crash”. For the first couple of weeks I was dipping into it, it was a bit of a messy look into the world of the undergraduate (this was a week before semester started, and a week after it started). There were some lovely messages about how excited people were to be coming back to uni and their mates. An awful lot of young men were discussing their onanist habits in graphic detail; an awful lot of young women were moaning that they couldn’t get a boyfriend. When I described this latter situation to friends whose only experience of university was as a student, they pointed out that the two groups could solve their mutual problems with the liberal application of alcohol. I just dip into YikYak when I’m waiting for my train home. But as semester has rumbled on it’s actually generally impressed me as a self-policing community. The horror stories from the US don’t seem to be happen. Unpleasant Yaks get downvoted (and then disappear) or have rather wonderfully barbed comments on them fairly swiftly. I’ve definitely not seen anything that would overly concern me given some of the issues on campus. I’ve posted some anonymous comments as well – such as suggesting students should see their personal tutors about problems. I’ve also picked up an inconsistency in the University in the way different schools interpret a particular attendance regulation which we would’ve remained blissfully unaware of. And my second attempt got ten votes and ended up with a score of -4. I think the anonymity of YikYak does actually help here, and as Pat Lockley suggested in a comment on a draft of this post, something we should explore doing more using ed-tech. Students will always think their question is a “stupid question” no matter how much we tell them it isn’t. Anonymity allows that hurdle to be jumped. It really was the peer-support of a student community at its best. It cheered me up no end at the end of the day. However, I had a couple of trickier moments. As I mentioned before on here, I shouldn’t have looked at YikYak after sending that announcement to my students. 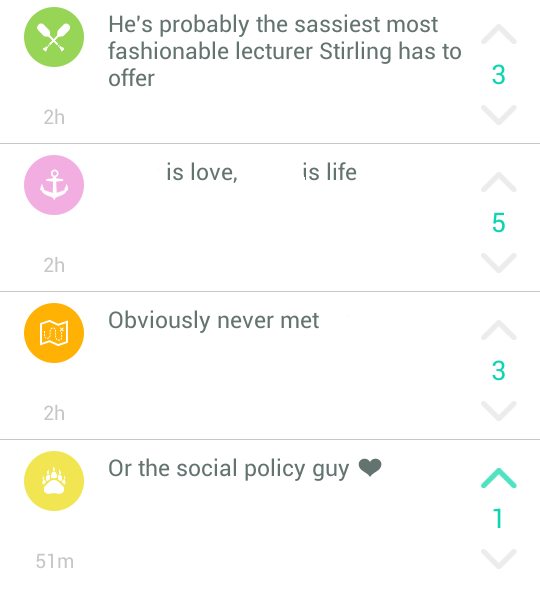 One thing I definitely should not have done is check YikYak on the day of my own module exam. I tried reassuring a few students who were clearly getting anxious, but in the end it just made me incredibly nervous that my whole exam was going to go wrong with students leaving the exam hall in floods of tears. Although, again, the anonymity shone through, with a number of students apologising in advance that they might let me down, which was very sweet, and something they were very unlikely to do to my face. I really hope they feel that they haven’t when the marks are released in January. A more tricky moment came with Yaks regarding a colleague’s classes. The students named the colleague in their Yaks and it always seemed to happen when I had the app open. Basically, as a group of 18-19-year-olds would do, they had realised how to get a rise out of the colleague and were organising on YikYak to do things in classes. It was nothing really severe, and in my judgement (a point I return to below) it definitely did not amount of bullying or harassment. However, given knowledge of YikYak among everyone apart from students seems to be zero, I thought I should probably do something. In the end I emailed the colleague’s Director of Teaching and Learning describing what was happening and left it at that. So, I don’t think YikYak is going to revolutionise either the world, or the delivery of higher education, but it is definitely an interesting world into which to dip your toe. My main reflection is, with the anonymity, I found myself thinking this is the students’ space, I do not belong here and should not be here (how I feel when I find myself in the Students’ Union) and also thinking about my online identity a lot – how much do I reveal. Could I give myself away in the way I interact? Should I give myself away? You can see that in my discussion with paw in the exchange above. (and I had to upvote that one. It would have been rude not to). The worst I ever got was in one of the exam day exchanges a student said “your module was shite anyway mate” which I could just shrug off as disgruntlement. But I have the cultural capital to manage such online spaces well and also the privilege to, largely, be afforded respect in such online spaces. I’m not entirely sure banning such apps and social media is the answer to the problems they have amplified. We need to tackle many of the problems – misogyny, racism, homophobia etc. – at source not necessarily attack the software. We also need to continue to develop our new ethics of online behaviour. 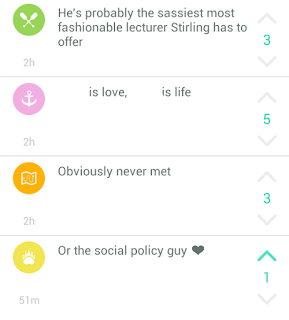 I'm a Senior Lecturer in Social Policy at the Faculty of Social Sciences, University of Stirling. I blog about urban policy, cycling and other ephemera in a semi-professional manner. All posts represent personal opinions. Producers or Predators in Regeneration?